Due to recent climate change, the character of environmental regional planning has shifted to address the anticipated extreme increases in sea level rise. As such, this project, based on existing scientific research/data, proposes a spatial, habitable landscape architectural solution as a model for flood mitigation for the East coastal edge. This proposal tests the potential for resilient coastal landscapes through a particular site located on Revere Beach, along with the New England coast in Massachusetts. The study demonstrates how through new public spaces designed to renew and protect the beach and the broader offshores, residents and visitors will be able to engage with this 21st Century, resilient beachfront. Also, residents and visitors will experience sophisticated efficient flood alleviation strategies during natural successive storm events. The inherent goal of this proposal is to create an innovative design intervention, which applies new principles of resiliency to the coastal landscape through a technical and cultural solution, and which can be a replicable model for global coastal edges elsewhere. Revitalizing Revere Beach, Ma is a case study to mitigate floods based on Bernoulli 's principle. This proposal projects an idea of connecting puddles with fissures a set of "Flute Channels", which is my innovation design approach to transfer water from coast to wetland behind it. It helps to lower down the sea level in high tides and sudden tides. 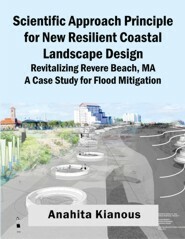 Retrofitting Revere Beach as a case study for flood Mitigate with a New Resilient Coastal Landscape approach started to study the watershed of the East Coast that includes three parts of North, Mid-Atlantic, and South Atlantic. Each has a flow that moves up and then inward to the east, in a concave pattern precipitated scale toward the north caused by the velocity of currents. In compare to the Pacific coast, this figuration came to appears as the convex pattern as the currents also are affected differently based on the climate and the land used materials. The project focused on how to manipulate waves and the currents to preserve the land figuration and creates the natural coastal landscape. Geo Technical research and scientific data is the fundamental study that I got the benefit of understanding the exact waves motion, density, velocity of water and how the different type of currents affect the land shape. My project is translating the science into landscape architecture. Earth and ocean are not sustainable- they’re dynamic, they’re shifting, they’re changing the landscape and coast components; land-used material as such salty sand beaches and ripple effects of waves affect the land in different ways. My hypothesis idea of retrofitting coastal landscape backs to its natural creation, which will be a combination of four components of barrier islands, bay or lagoon, thumb-lands or forelands and wetlands. These four figurations are shaped based on different wave motions and currents. I discovered two scales of the solution. Short and long term phasing. For the long term, I suggested floating island, which I examined it by the different objects adding to the coral reef at the Revere Beach. Objective, found a missing part of coastal components, the floating islands. And, Flute Channel was innovative design approached by science data of Bernoulli’s principle. In this term, water transferred from coast to the wetlands behind it. The connected containers science data was a combination solution to this creation. Anahita Kianous currently serves as principal of the Design with Nature & Coast Limited Partnership and a Milestone member of American Society of Landscape Architecture(ASLA). She is an award winning in 2015 for her thesis project, Landscape Architecture Prize, and the Boston Living with Water Competition. Previously, she awarded so many prizes from 1996 to 2007 for her achievements in research, design, and science. Since 1997, after she graduated from her first master degree of Art & Science in Architectural Design, she became a member of Code and Standard Organization Construction Engineers. From 2008, when she established her own company of Boom Aria Memar Co., she was considering nature in all her designs and trying to keep it as the best human life resources in all neighborhoods she was retrofitting. The immigrant to the USA helped her to study and graduate in her favorite field with a master degree in Landscape Architecture in 2015. Helping people and thinking of the quality of life for everybody is one of her goals. Anahita served as a volunteer member interpreter for the Boston Housing Authority since 2013 and recently became an instructor at the BAC, where she is an excellent alumnus class 2017. The recent vulnerable coastal events motivated her to work and study hard more than a need for a project, but for human life-saving in the east coast of Revere and East Boston, where she recently awarded for her thesis, a commendation from Boston Architectural College. This project presented at the City of Revere Beach, Development Department in August 2015, and also had a webinar at U.S. Army Hydraulic Lab in Mississippi, Vicksburg in July 2016.